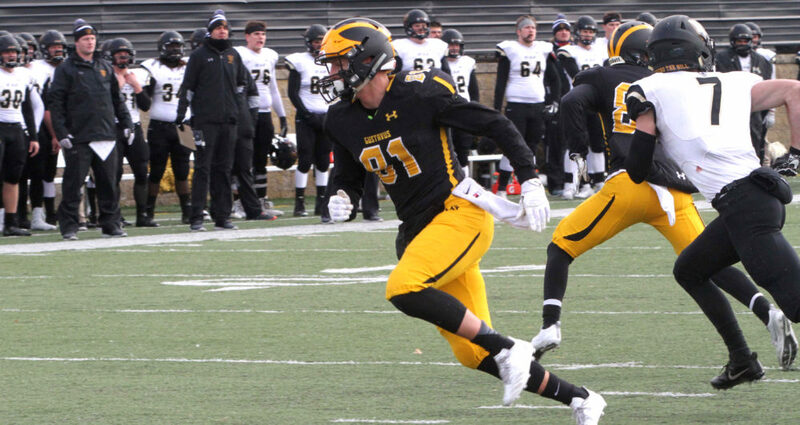 NORTHFIELD, Minn. – The Gustavus football team battled freezing and snowy conditions at St. Olaf on Saturday afternoon and wrapped up its 2018 season with a 29-20 win. The Gusties finish the season 6-4 overall and 5-3 in the MIAC. After allowing a 58-yard touchdown pass on the opening drive of the game, Gustavus responded with a five-play, 62-yard scoring drive to tie the score 6-6. Brayton Finch (Jr., Mount Morris, Ill.) ran 20 yards for the touchdown and Josh Kirk (Jr., Garvin, Minn.) ran in the two-point conversion to take an 8-6 lead. On their first drive of the second quarter, the Gusties marched 63 yards in nine plays, ending on a 21-yard touchdown pass from Michael Veldman (Sr., Becker, Minn.) to Ellis Hirman (Sr., Zumbrota, Minn.). The Oles answered with 5:45 scoring drive to tie the score 14-14 with 3:26 remaining in the half. Gustavus’s third series of the second half featured three consecutive completions of at least 16 yards, ending on a 33-yard strike from Veldman to Brice Panning (Jr., Hamburg, Minn.) for a touchdown. The two-point try was successful and the Gusties never gave up the lead the rest of the way. St. Olaf made things interesting early in the fourth quarter with a 71-yard touchdown rush, but the two-point conversion failed and the Gusties held on to a 22-20 advantage. With 5:12 remaining in the game, the Gusties made it a two-possession game as Veldman connected with Panning for a season-long 71-yard touchdown pass. Gustavus put the proverbial nail in the coffin as Brady Miller (Sr., Delano, Minn.) intercepted a pass with five minutes left in the game and then ran four minutes off the clock. Gustavus outgained St. Olaf 454-379 in total yards of offense, led by a 367-yard passing performance by Veldman, who completed 29-of-51 passes with three touchdowns. Panning was the big-play receiver with six catches for 162 yards and two touchdowns. Hirman had eight catches for 91 yards and a score. Avery Bachman (Jr., St. Peter, Minn.) and Jake Boykin (Jr., Las Cruces, N.M.) led the defense with five tackles apiece.